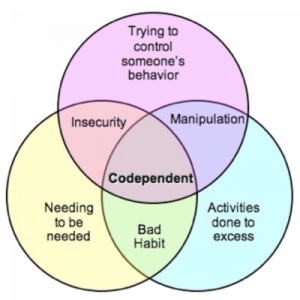 Codependency can be defined as a condition that affects people in such a way that they enable a person close to them to commit abuse by aiding and protecting that person. Many signs of codependency seem like normal behaviour. Caring for a needy person does not make you a codependent. However, when the act of caring is excessive, unnecessary and actively hidden behind a facade of normality, it becomes codependency. Compassion is normal, but not when it is so overwhelming that it causes you to pursue needless suffering without seeking a proper solution. Codependents create an illusion of normality to preserve the status quo while they, and others, suffer ongoing hardship. They are caught in a kind of love-hate relationship. They do not enjoy it, yet they maintain it. This is usually due to deeply embedded emotions or learned behaviours that compel them to preserve, rather than heal the problem. Clinically, codependency, or co-alcoholism, does not mean that you abuse alcohol. It means you are co-existing with an alcoholic and making it possible for that person to continue drinking. You suffer from the fallout of the abuse, but you suppress your discomfort. You feel unable or unwilling to change the situation, so you continue doing it. In this way, you become a codependent of an alcoholic. Codependents are family members, partners or friends of alcoholics. They hide the problem and help the drinker in various ways. Their actions enable the person to continue drinking. They sacrifice themselves and do not seek help. They dread the consequences of exposing the problem, but they are unable to solve it without help and so it becomes an ongoing cycle. Codependents do many things to prevent discovery of the problem and to cope with the circumstances. They tell lies to protect the alcoholic and themselves. They downplay the severity of the situation. They isolate themselves and avoid emotional discussions. They take on neglected chores and assume roles normally performed by the alcoholic. They become caregivers and neglect themselves. It delays help for the alcoholic and the problem intensifies. Their actions may be due to, among other reasons, a desire to please a manipulative partner, to avoid shame, to preserve peace, a sense of duty, fear of the abuser, or even because of love or a strong bond. Friends do it in a misguided attempt to help. Codependents, themselves, are often subconsciously driven by hidden emotions inside themselves that compel them to act as enablers. Children who grow up in such homes also adopt codependency and often have problems later in life. They have deeply embedded emotional wounds and they lack skills which are necessary for a normal life, because their parents were dysfunctional role models. As grownups, they distrust people, have low self-esteem and seek approval from others. They are used to dramatic upsets and not averse to starting relationships with addicts or becoming addicts themselves. Awareness of this traumatic legacy has led to various treatment techniques for adult children of alcoholics. By enabling the abuser, they harm themselves, but they fail to see their own complicity and blame alcohol as the sole reason for the suffering. They see their actions as a saintly way of coping with the problem, rather than contributing to it. Often, they are unaware that their own emotional dysfunctions are blocking them from resolving the calamity. Some people are quick to advise simply breaking up a relationship when a problem develops. This is not always the best solution, as a breakup can produce severe problems of its own. The nature of people and relationships are complicated and differ greatly. There is no single solution that fits all. Modern therapy methods can heal many damaged relationships, as well as the root causes that led to it. Logically one should get professional advice on a personal level, rather than relying on random opinions. In the past, treatment for alcoholism centred on the abuser, but largely neglected the plight of codependents. Awareness about this vital aspect has grown and, today, there are many well-proven therapeutic techniques to enable codependents to move forward to a better life. The ideal solution is to convince all the role-players in a codependent relationship to commit to treatment and to make a fresh start. If necessary, an experienced therapist can assist with an intervention to accomplish this. The first port of call should be a rehabilitation centre where all these problems are dealt with on a daily basis. Even if a breakup should occur, the codependents will be better informed and will not take their impairments with them into future relationships. Why do you become a codependent? Codependency is mainly established during childhood experiences in a dysfunctional home. The children learn unhealthy coping skills, whilst missing out on values like stability, security, trust, respect, bonding, honesty and open discussions. The imbalance follows them into adulthood, where they apply the same rules. Codependency can also develop in adulthood, after long exposure to an addict. The codependent may have endured and adapted to the punishment because of ignorance, or for other reasons not related to childhood trauma. Sometimes friends or coworkers shelter an addict by doing tasks the addict had neglected or by telling lies to an employer to protect them. This is not abnormal, provided that the friend or coworker draws the line at a reasonable point. If they allow the situation to cross that boundary, they become codependents. When someone is financially dependent on an abuser or fears physical abuse, they may, initially, not have underlying emotional disorders, but if they follow the same routine, they develop codependency disorders as a result. If the victim does not want remedial action after long exposure, then codependency may have taken root. Some people, who come from stable homes, succumb to codependency because of a personality trait. There are, indeed, people who have naturally overdeveloped senses of duty, compassion and empathy. However, this is often due to an underlying emotional factor that they are unaware of. Many people deny this problem, or are unaware of it, until it is properly explained to them. Most see it as a natural and redeeming part of themselves. This is mainly due to society’s general perception that people who help the needy, are the best people. There is also a universal tendency in all of us to resist change, which makes it even harder to admit this problem. Couple that to the worldwide increase in lifestyle pressures, relationship problems, dysfunctional families, divorces, addictions, and so on, and the result is that a huge sector of society are prime, and willing, victims of codependency. Note: There is a difference between helping and sacrificing and the two should not be confused. Codependency is a form of sacrificing – not just yourself, but also others – rather than helping anybody. Do you feel offended when your offer to help is rejected? Do you overcommit to other people, committees or work? Do you eagerly volunteer for charity or community work? Do you avoid talking about your own emotions? Do you feel worthless or guilty when you are relaxing? Do you often work long hours without recognition? Are you constantly trying to please other people? Do you often worry about other peoples’ problems? Do you find yourself in repetitive bad relationships? Do you work long hours, because you feel needed? Are you restless when spending time alone, by yourself? Do you often blame others for your problems? Was your parental home dysfunctional? Has anyone asked you to stop helping them? Is it difficult to say “no” to requests for favours? Do you often make excuses for other people? Do you feel an urge to rescue people in need? Does it please you to make sacrifices for others? Do you choose partnerships with people who need you? Do you try to help with problems beyond your ability? Do you attract people who need to be taken care of? Do you attract the needy who are unwilling to change? Do you change the subject if asked about your problems? Do you see a pattern of enabling in your life? Note: The number of “yes” answers is not a good guide, as some questions will be more important than others in your personal profile. However, if you answered “yes” to 12 or more questions, professional advice should be your next step. Do codependents really need help? Most codependents do not see their act of enabling as a problem on their part. They blame the entire situation on the drug or the addict. They feel the whole problem will go away if the drug is removed. Until then, they see their own supporting act as an unselfish, virtuous way to help a sick person without breaking up the relationship or the family unit. Most codependents are good, kind people with no malicious intent. It is also important to note that codependency is not a mental illness. However, research has revealed that codependency causes a lot more harm than good and that it is actually subconsciously triggered by underlying emotions in codependents, which hide the real reason for their actions from them. They are quite unaware of their contribution to the problem. The subconscious emotions which drive most codependents, originate from long term exposure to addicts, either as children or as adults, which leads to the codependent developing a need for acceptance and control, amongst many other things. It can also be caused by oversensitivity to the opinions of others, or overdeveloped emotions of sympathy, empathy and kindness. These are some of the actual reasons for a codependent’s actions. Although the abuse carries on for a long time, the codependent makes little effort to have the cause remedied. Instead of putting all their energy and effort into removing the drug, they make it possible for the abuser to continue using it. The drug does not magically disappear and the addict has no motivation to change, so the dream of the situation correcting itself, never materialises. In the process, the ongoing consequences of the abuse causes ripples that spread wider and wider and intensifies the hardship of many people who are touched by it. Through all this, codependents stand firmly by their own methods, namely protecting and aiding the abuser, mostly to satisfy their own subconscious needs, until they are virtually forced to accept change. Only when they understand and accept the real facts, can the problem be solved. Sometimes the suffering reaches such a critical point, that the codependent is forced to seek help for the addict. Even then, they may not want to submit themselves and will remain vulnerable to a repeat of the whole sequence at a later date. In order for treatment to be effective, the abuser and all the codependents should undergo therapy. Even in cases where the relationship had broken up, the codependents will require therapy, otherwise they will simply take their dysfunctions with them into the future. Codependency not only affects relationships, but quality of life in general. The same symptoms that compel codependents to aid an addict, will disadvantage them at work and in many other areas of life. They tend to have submissive, manipulative, sacrificial and many other symptoms that must be healed if they want to enjoy a normal, happy life. Codependents can react angrily when treatment for them is suggested. They usually feel they did not cause the problem and that they are not addicted to the drug. They believe if the addict is cured or the drug taken out of the equation, the entire problem will be solved. It is important that they be properly informed about how codependency works and why they require counseling. It is also important to stress that codependency is not a mental illness, but that it is extremely important to undergo therapy for the subconscious emotional wounds and conditioning and how this will affect their entire lives going forward. Codependents have to make big adjustments. Most of the codependent’s time and energy had been focused on the addict for a long time. They must learn to focus on themselves again. In most cases there will also be complex emotional issues that a therapist will help them to discover. The therapist will then design a treatment plan to rectify these and a plan for coping with normal life after the big change in lifestyle that the treatment will bring about. Once the treatment process had been completed, the former codependent can move forward without the burden of the disorder. They will be able to resume a normal role in life, not just in the current relationship, but also in future relationships, as well as many other aspects of life which are influenced by it.